Katrina's Kreative Heart: Oh Baby! I am so excited! I have been invited to bring my hand-made cards to a local children’s clothing consignment shop. This is such an honor and a blessing. I was so surprised and so excited when the owner asked. This was certainly not on my radar. I guess this just goes to show, God works things in his own way and in his own time and opens doors we never noticed on our own. I created this one to go along with this weeks card sketch challenge taking place on my Facebook page. Please stop by and join us. There are so many wonderful ideas being shared by such friendly and lovely women, who support one another and encourage each other, that I’m sure you will find inspiration for your own creativity. You can find us at www.facebook.com/snsfromtheheart. In addition to all of this, I have been learning to use my new Cricut Explore Air. 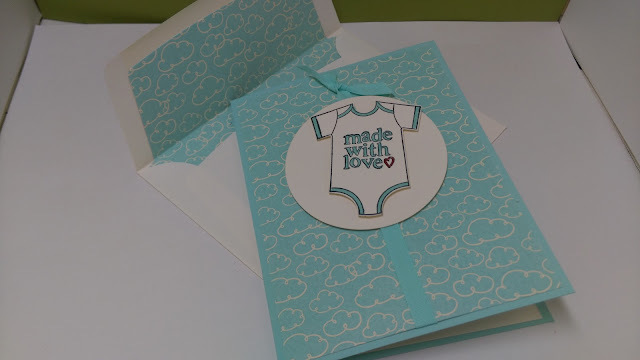 I completed the little card project they have you do as a first project so that you learn to use the pen that comes with the machine as well as cut. Simple enough. So I decided I wanted to create some word art for my craft room walls, I got some vinyl to cut and it was a disaster! I cut the pattern out twice and both times I ended up with a waded up ball of vinyl! Cutting it with the Cricut is the easy part..trying to remove the negative space is a nightmare! I had vinyl sticking to everything until it literally became a wad of vinyl! So, if any of you reading this has ANY idea on how to not have the vinyl stick to itself as you are lifting and peeling back, I would be eternally grateful. I will try anything…I really want to decorate my walls with the vinyl! So, please, if you know that answer to this, leave me the answer in the comments section below. As I said, I will be eternally grateful to you!